An astonishing technique for recovering and cloning dinosaur DNA has been discovered. Now, one of mankind’s most thrilling fantasies has come true. Creatures extinct for eons now roam Jurassic Park with their awesome presence and profound mystery and all the world can visit them – for a price. 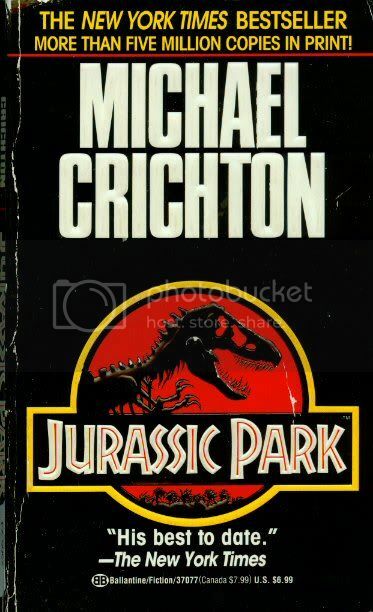 In JURASSIC PARK Michael Crichton taps all his mesmerizing talent and scientific brilliance to create his most electrifying techno-thriller yet. I remember watching Jurassic Park in the movie theater when it first came out. I went with two good friends and it was a pretty cool experience, one that I remember a lot. In fact, I remember the book popping up all over the place and my first thought was always, “I loved the movie!” Recently the movie aired on one of the channels and for the first time ever, I thought, “How come I never read the book?” I tracked down a copy and decided to give it a read. I enjoyed it. I’m not sure I enjoyed it because of the movie or if the book was a good read. I didn’t get bored except whenever Ian Malcolm went on one of his rants about how the park was destined to crumble. I was surprised that in the book, the brother was the older and the sister was the younger. The only thing I was confused about was the end of the book on why it was so important for Grant and Sattler to hunt down a raptor nest. Why did it matter on how many eggs that hatched? Why put themselves in an extremely dangerous situation? Can a movie be better than the book it was based on? Dragon banner made from this image.